Crap & Couture: SPRING 2010 Jewelry, Bags, Shoes: More is More! DETRA KAY JEWELRY DESIGN (detrakay@bellsouth.net) pieces put the emphasis on natural materials. Ms. Kay works with semi-precious stones, gold, silver, and vintage pieces and objects that result in exotic, ethnic, classic, floral or unique must have items. My faves include her Thai silver floral choker and the mother-of-pearl necklace consisting of flat drops, gold leaves and a vermeil clasp. I also liked the concept behind REAL JEWELS. (real-jewels.com.) The collection combines lovely designs with respect for our planets resources. Everything’s made in the U.S. of 100% recycled precious metals, conflict free diamonds and fair trade sustainable gems and every piece is embellished with a signature fair trade natural green peridot tag. I’d check out the silver necklace with lacey pendant (sort of an ethnic feel) but there’s lots to choose from. Also offering some stunning necklaces is LAUREN ADAMS. This is the one to hit for bright colors and graceful prints fashioned into enamel and metal. Personally I’d suggest the gorgeous turquoise centered white enamel pendant necklace from her “Eilat” group but I gotta tell you that the coordinating cocktail ring and bangle are to die for. Other groups to check out include the “Cameo Rome” and “Lady Luck” collections. Look for this resource in better specialty stores. Want something with more of an ethnic modern vibe, then check out BOTTICELLI’S NIECE (www.botticellisniece.com). What worked for me was the short gold “double flake” necklace on a black double cord and the “Mariner link” bracelet - offered in both gold or silver – on a knotted leather strap. It’s bold, chunky and will work nicely with all of your Gucci/Hermes (ha, as if) wardrobe. Now that we’ve taken care of spring let’s move on to summer shall we? At the recent press event for Ann Taylor LOFT, there were some adorable items (not to mention some terrific sportswear pieces). Number one on my must-have list is the striking black beaded bib necklace. Sure it’s not dirt cheap at $89.50 but this piece offers the most bang for the buck. Another cute bib necklace features grey chiffon on a silver link chain. GERARD YOSCA is always on my fashion radar and I’ve been a collector of his jewelry for many moons. Yes I know, his prices aren’t cheap but you get what you pay for (at least in his case) in terms of elegant styling and quality, not to mention longevity. Let’s get down to business – I personally like the oxidized copper necklace with “fire coral” stones from his “Native American” range, but let’s be real, all his stuff is gorgeous. On a totally different wavelength is PIXELMODA. (www.pixelmoda.com,) I’m talking about a watch! 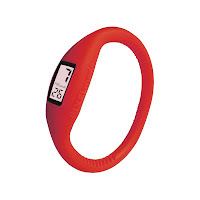 It’s a brand new digital time piece fashioned in ultra light, high silicone rubber. We’re talking about an ergonomically shaped bracelet style that comes in over 39 colors (and at a retail price of $20 bucks you can afford to buy in multiples) and three sizes. Watchbands? PixelModa says your time is up! Moving on to Fall 2010, I found another fabulous accessory resource that combines the best of neckwear with jewelry. VESPERS (Vespersnewyork@aol.com) is also a brand spanking new collection made right here in New York. It’s almost too hard to describe the intricate draping of exquisite fabrics with chains, etc. Any one of Vesper’s pieces will make the simplest dress standout! I adored everything! Speaking of fall, there are some terrific footwear resources to note. Among my favorites: EMU, the Australian sheepskin collection could easily give Ugg a run for the money. In addition to the sporty jackets and knits was the “Illoura” below the knee boot with adjustable vintage leather belt with antique metal details and the lace-up “Tundra” boots. Boots continue to be a major trend so keep your eyes peeled for Stephen Kelian’s signature woven leather riding boot. This French firm is at the moment only available in Europe but hopes run high that a savvy US retailer will order the collection. Let’s talk about shoes. It’s high time you stepped out of those ridiculous sky high platform stilettos and into low heels. On trend are ballerinas (of course) and the spiffy lace-up spectators. These two styles will be found at every price level and should be on your shopping list. Let’s say you’ve bought a closet full of shoes, now it’s time to add a handbag to your shopping list. If big is your thing, then L.A.M.B. has two great options. From the “Dunkirk” range I’d buy the army green pigsuede hobo. It’s rugged, casually chic and will hold a ton of stuff. For more flash check out the lamb logo pvc tote In blk/white/red from the “Signature” group, or get it in the vivid graffiti print. L.A.M.B. Gets It, You Should, Too! Only LOVE MOSCHINO could come up with the idea of making a tote bag in satin, adding chain handles and gold hardware closure in the shape of a clothespin and offering it in 14 colors! It’s very tongue-in-chic and a real eye catcher. Also roomy is Moschino’s brown suede handbag, trimmed with tassels from the “Happy Hippy” group. New to the handbag game is NANETTE LEPORE who showed a handsome collection in a variety of leathers, from lizard embossed lambskin to a cheetah print Italian haircalf and more. Styles range from convertible satchesl and totes, to hobos and darling little framed cross body bags. You’ve got to figure on spending around $500 bucks (give or take), but compared to some of the other “designer” junk out there at double or triple the price, Lepore’s bags offer good value for the money.